The earliest Aubusson rugs can be traced to the 1580's when weavers fleeing from Flanders took refuge in Aubusson, a village that sits astride the confluence of the Creuse River and the Beauze in the Limousin region of central France. The waters of the Creuse are reputed to be excellent for dyeing wool. 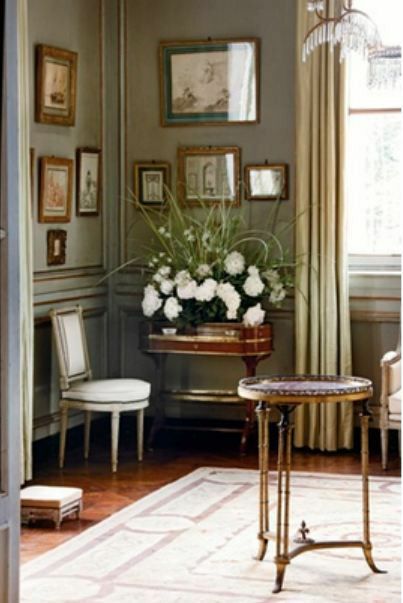 Aubusson rugs combine motifs from classical Roman architecture softened by floral flourishes. Aubusson rugs are handmade in durable flat-weave textures that have a clean, almost contemporary look. 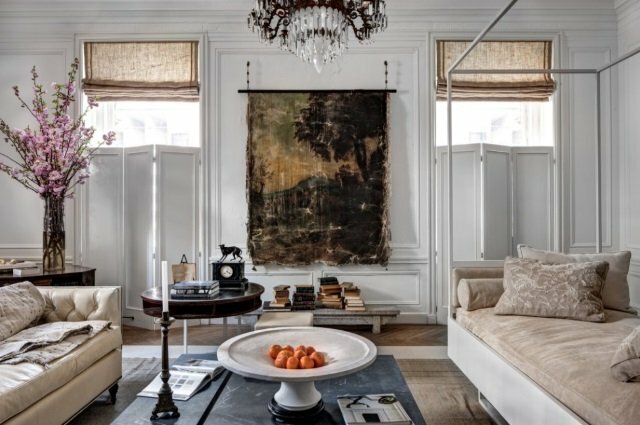 Aubusson rugs are equally at home in a glamorous English country estate, a French château or a contemporary art filled Manhattan penthouse. If you like the look of Aubusson rugs but prefer pile rugs then you will love their royal cousins, Savonnerie rugs. If you think Aubusson rugs are only for classical and traditional rooms you will be surprised how well they work in contemporary spaces and how well they complement blue-chip contemporary art and 21st-century design. Aubusson rugs come in a variety of color palettes. Aubusson rugs in fresh clear are highly sought after as well as rugs that have dramatic colors such as black and gold combinations. Buy a rug only when you love the colors and pattern. Do not be swayed by a royal provenance, if you do not like the rug itself. Look for Aubusson rugs that will work with both contemporary and traditional furniture because they allow you to mix different styles together and will make it easy to change the decor of the room in the future. The best way to select any rug is to try a sample of the rug in the room. If a sample is not available, try the actual rug in the room. Asmara ships rug samples by UPS. Just click the orange "Request Sample" button when you've found a rug you want to see in person. 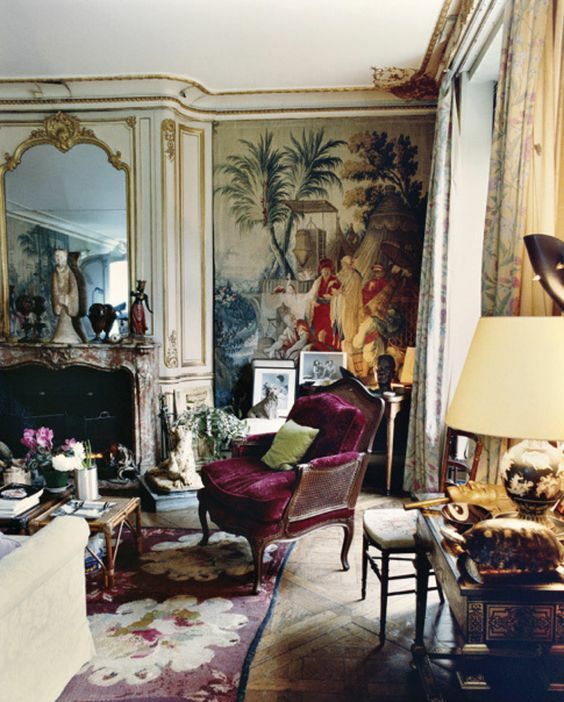 Here are 19 ideas for decorating with Aubusson rugs illustrated by some of the most fabulous rooms. 1. 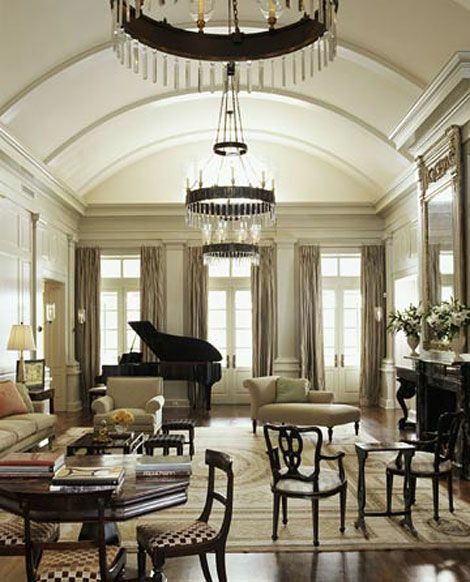 A cream, beige and charcoal neoclassical Aubusson rug such as the Asmara Malmaison rug creates a wonderful anchor for a music room or a grand living room as in this space designed by Lee Ledbetter Architects. Image courtesy Lee Ledbetter Architects. 2. 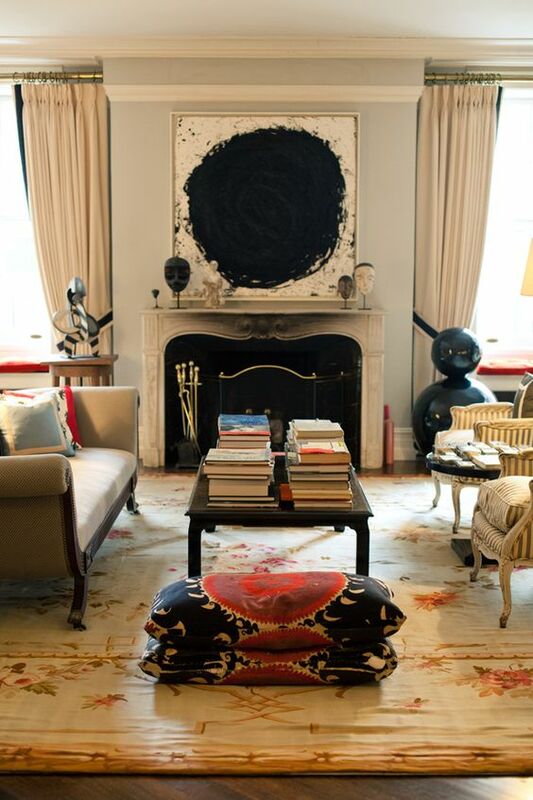 A colorful Aubusson rug provides a great way to pull together contemporary art in this stylish Manhattan living room of Kate Spade. Image courtesy Kate Spade. 3. An Aubusson rug with large exotic green leaves is a perfect way to design a light and airy bedroom. 4. An Aubusson rug with burgundy red accents allows you to design a romantic and cozy bedroom as in the New Orleans home of Julia Reed. 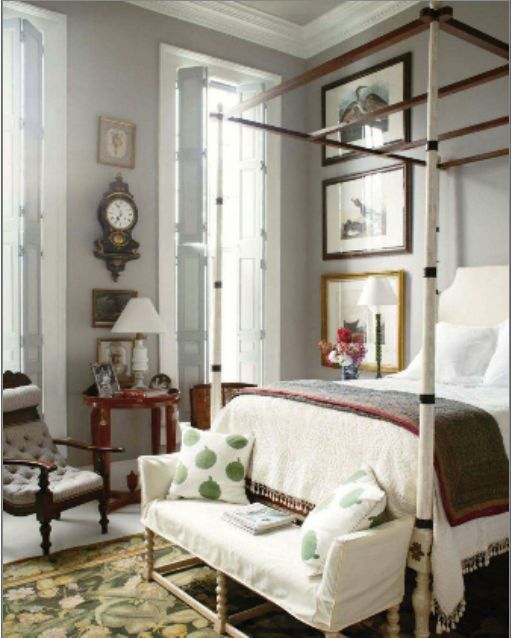 Image courtesy Elle Decor. 5. An Aubusson rug in muted gold colors allows you to mix contemporary furniture and traditional art as in this living room by Darryl Carter in the Kips Bay Decorator Showhouse. New York Times Image. 6. 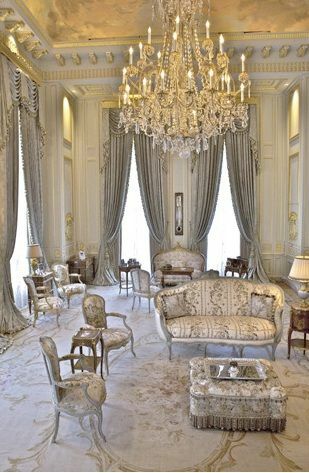 A beige and blue Neoclassical Aubusson rug paired with white walls and pale upholstery can create a modern atmosphere in a traditional French room as in the living room of the manor house in Bordeaux of the brothers who own Hermes. Image courtesy Architectural Digest. 7. 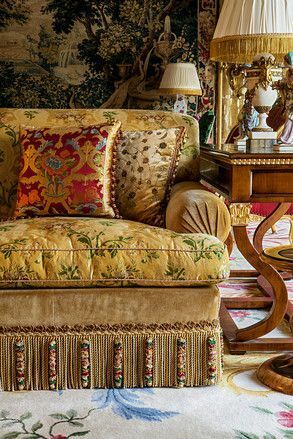 A beige and red Aubusson rug is a great complement for clear colored floral chintz fabrics as in the English hunting lodge of designer Nicky Haslam. Image courtesy Nicky Haslam. 8. A cream Aubusson rug with clear top colors makes a room with rich upholstery fabrics and tapestries feel fresh and inviting as in this living room by London designer Alidad. Image courtesy Alidad. 9. 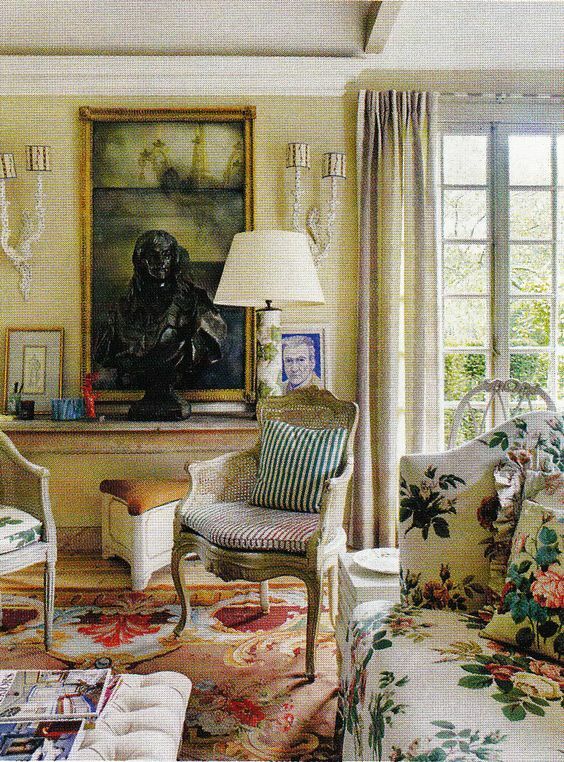 A muted Aubusson rug is perfect for restoring a traditional living room as in this 1933 home in the River Oaks district of Houston rejuvenated by designer Kara Childress. Image courtesy Architectural Digest. 10. 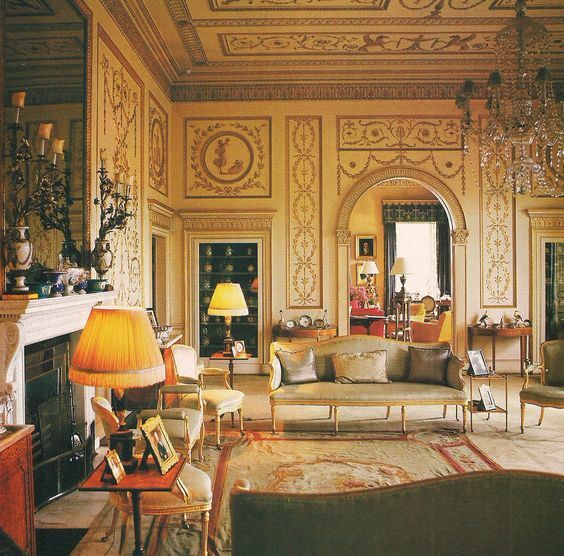 A neoclassical Aubusson rug with gold, brown and red is wonderful for pulling together rich silk fabrics while creating a modern vibe as in this Nicky Haslam designed drawing room in the home of hoteliers Frances and Rodney Smith. Image courtesy Architectural Digest. 11. 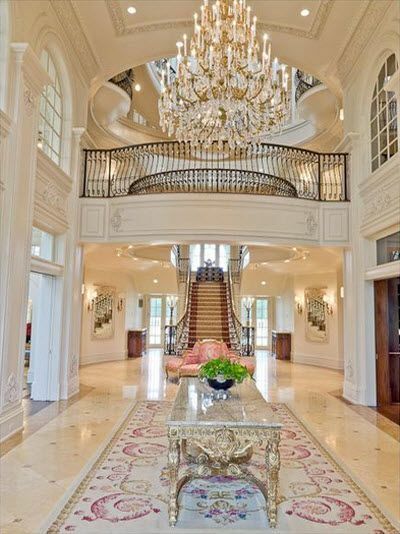 Aubusson rugs are often used to create a grand look as in the hallway of this palatial California home. 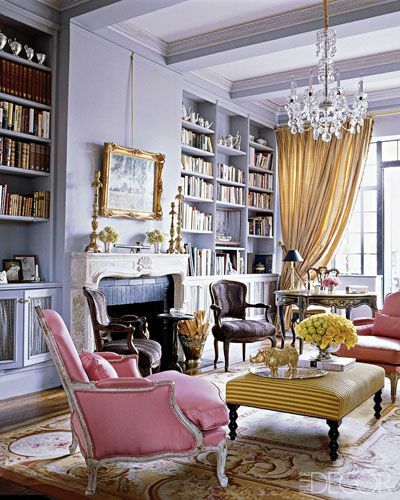 Image courtesy Elle Decor. 12. A pale gray and gold Aubusson rug allows you to create a traditional living room that looks rich but still feels serene. 13. 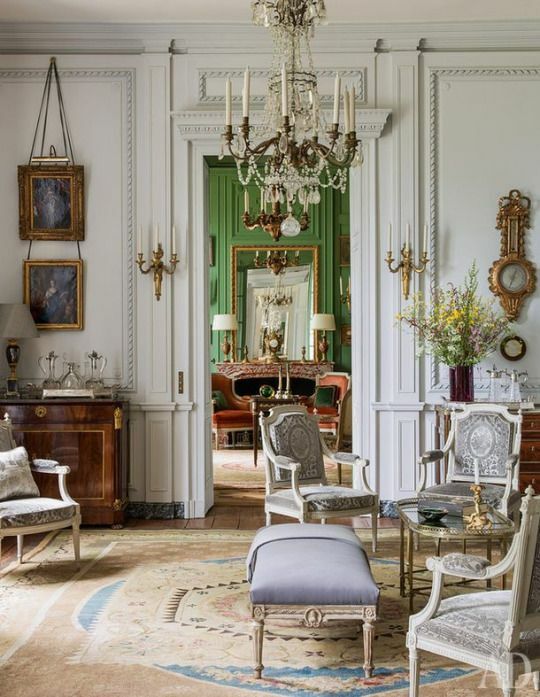 A traditional Aubusson rug is a great complement for Neoclassical architecture and English and French antiques as in the salon designed by David Hicks in Broadlands, the former home of the Mountbattens. 14. 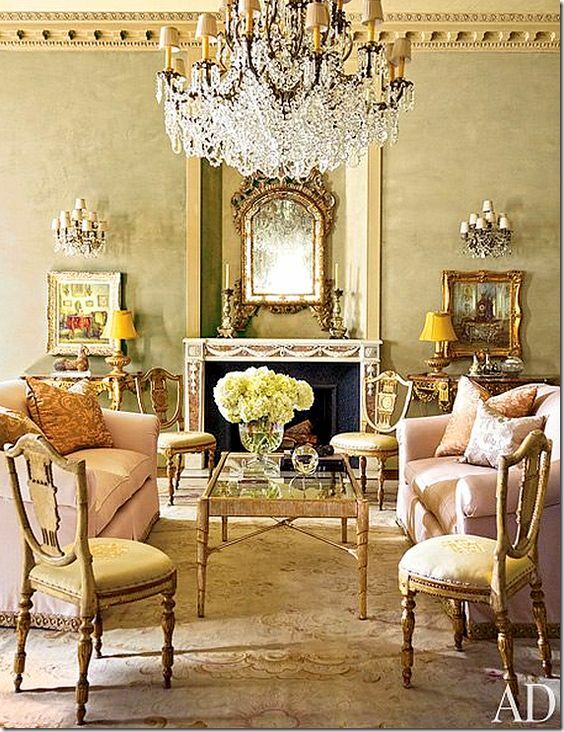 A cream and gold Aubusson rug provides a great setting for lavender walls and pink and gold upholstery. 15. A cream, gold and burgundy Aubusson rug with a simple architectural frame allows you to create an elegant atmosphere in a traditional living room as in the Chateau de Groussay. Image courtesy Habitually Chic Blog. 15a. 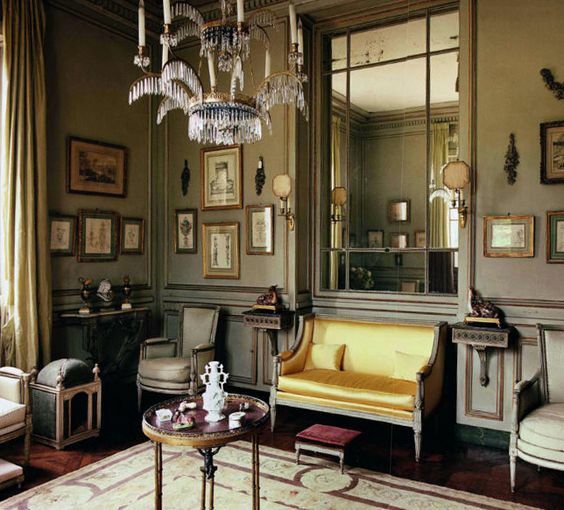 Another view of the salon in the Chateau de Groussay. Image courtesy Habitually Chic Blog. 16. 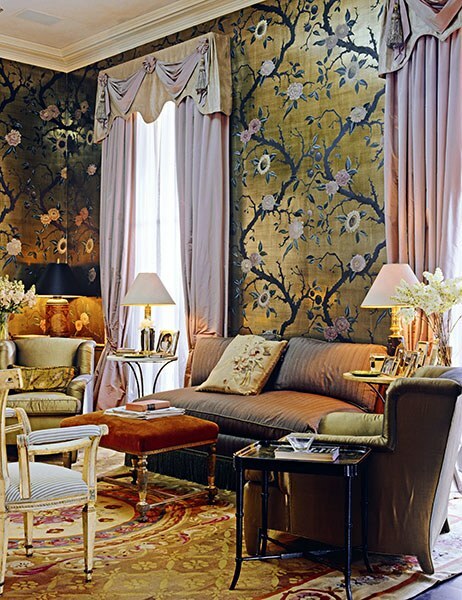 A pale Aubusson rug is a great complement for Chinoiserie. 17. An Aubusson rug with a purple background allows you to create a romantic atmosphere as in the living room of Schiaparelli's Paris apartment. Photo by François Halard. 18. 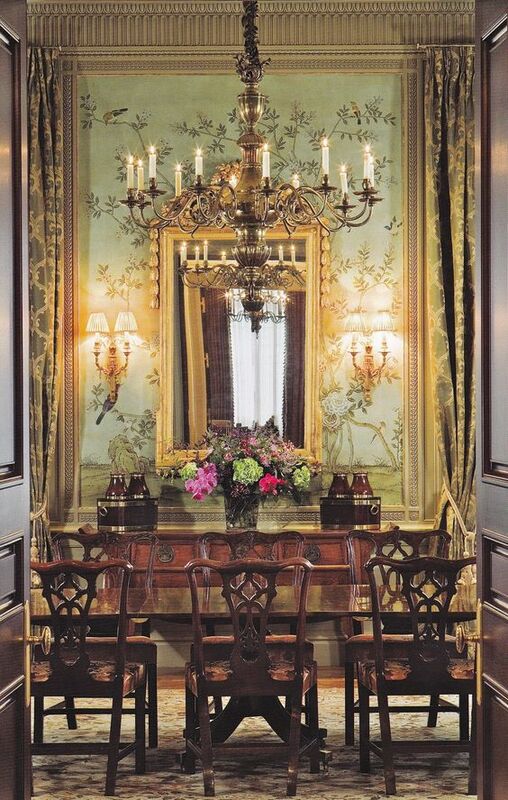 An Aubusson rug is a wonderful complement for Chippendale dining chairs and Chinoiserie wallcovering. 19. 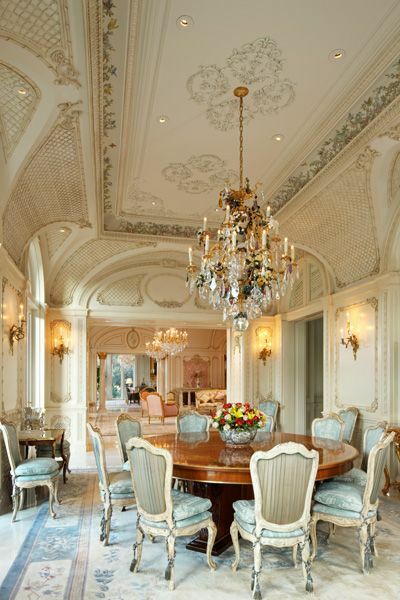 A cream and blue Aubusson rug allows you to create a light and airy atmosphere in a traditional dining room.